The Virgin Galactic suborbital vehicle SpaceShipTwo, called Enterprise, soars over New Mexico's Spaceport America terminal – still under construction – under the belly of its huge mothership WhiteKnightTwo during the spaceport’s runway dedication ceremony on Oct. 22, 2010. Work on Spaceport America is infull swing, with thestate-of-the-art space launch facility near Truth or Consequences, N.M.expected to become fully operational in 2011. Officials at SpaceportAmerica here have been working closely with their anchortenant ? VirginGalactic ? in the company's quest to provide pay-per-view passengertreks to suborbitalspace. Other leading aerospace firms,such as Lockheed Martin,Moog-FTS, Armadillo Aerospace and UP Aerospace, are also moving towardincreased use of Spaceport America facilities to push forward on theirspaceventures. "Spaceport America is pretty closeto what weoriginally envisioned. We're on track," said Rick Homans, executivedirectorof the New Mexico Spaceport Authority. "You can really feel it now.Timeis becoming more concentrated and condensed, and the pressureis buildinginternally to set up operations for the spaceport to anticipate allkinds ofissues that may not have been as clear three to four years ago." While December 2011 was previouslyprojected as thestart of commercial operations, Homans said that Virgin Galactic, isnot goingto be held to a timetable. "They are going to be held to successfulcompletion of milestones." For Spaceport America's part,Homans said, the biggestchallenge right now is moving from a construction project to VirginGalactic'sfirst commercial launch from New Mexico and putting in place policies,proceduresand staffing at the $212 million facility. Still to come is the installationof welcome centers innearby counties, a visitor center at Spaceport America, as well asgauging the numberof people that are expected to travel to the facilities, Homans said. "Wedo know that this is going to attract a lot of people. What that means,inbright green letters, is opportunity?and it means businessdevelopment,"he said. "They don't need very much rightnow. That's thebeauty of these companies at the moment. They don't want us to put in awholelot of infrastructure that they suddenly have to pay for. They want usto keepit very simple and very basic," Homans said. Armadillo vehicles would fly fromalready-in-place launchpads, situated approximately six miles from Spaceport America's mainstructures. The development at the spaceport,and in other commercialspace ventures, is beginning to attract the notice of lawmakers, Homanssaid. "There are signs that the federalgovernment isslowing turning its head to take notice of this commercial spaceflightindustry. In the years before we had seen no motion?hadn't seen thathead turna centimeter. Now it's almost making eye contact with us," Homans said. Several Armadillo spacecraft areset to begin testingsoon at the spaceport, Neil Milburn, vice president of programmanagement atArmadillo Aerospace in Rockwall, Texas told SPACE.com during lastmonth'sInternational Symposium for Personal and Commercial Spaceflight innearby LasCruces, N.M.
"We're looking forward to it,"Milburn said.One rocket to undergo evaluation is a low-cost alternative for reachingsuborbital space with scientific payloads. That vehicle and otherhardware willaim to hone the company's ambitions to build a suborbital space tourismvehicle. "All the stuff we've got areflying testbeds,"Milburn added. Armadillo will also use the Oklahoma Spaceport to fleshout someof their vehicles, he said, but they are restricted to the altitudethey canreach there, with higher altitude test shots available at SpaceportAmerica. 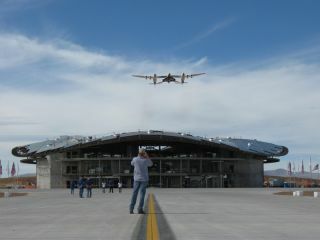 WillWhitehorn, president of VirginGalactic,said: "Everything has come together. Virgin Galactic is nowfully-funded through commercial launch. Spaceport America is going tobefinished and it looks every bit as good as I thought it was going tolook." Thesolo flight by SpaceShipTwo wasviewed as a major milestone for Virgin Galactic, Whitehorn said. "Designinga vehicle that's capable of being a supersonic aircraft, a spaceplaneanda good glider is a real challenge," he emphasized. "Sowe are feeling quite proud atthe moment. We've got the beginnings of commerciality," Whitehornadded.WhiteKnightTwo has also proven to be a very robust vehicle too. "There'snothing that I can see inthis program at the moment that is leading to sleepless nights,"Whitehornsaid. The main runway at SpaceportAmerica was dedicated lastmonth as the Governor Bill Richardson Spaceway, after the out-going NewMexicogovernor who had supported the facility from scratch. The 42-inch thick spaceway isdesigned to support nearlyevery type of aircraft in the world today. That long stretch of runwayis madeup of 24 inches of prepared subgrade, followed by four inches ofasphalt, andfinished with a 14-inch layer of concrete. "Clearly, the runway is a majorachievement,"said Whitehorn. "Building a runway to the necessary quality andstandardis not easy in this part of the world." The Governor Bill RichardsonSpaceway will be able toaccommodate returning launch vehicles, fly-back rocket boosters andother spacelaunch and training vehicles. The entire airfield at SpaceportAmerica measures 332,000square yards, including the concrete runway that is 200 feet by 10,000feetlong, as well as taxiways and related drainage and signage. Leonard David has beenreporting on the space industryfor more than five decades. He is past editor-in-chief of the NationalSpaceSociety's Ad Astra and Space World magazines and has written forSPACE.comsince 1999.